Passion, safety, professionalism, a good crew and a personal approach to the customer are the primary basis for a great diving resort. That is what Sea Spirit Diving Resort is and aims for. We are located in Giardini Naxos and offer diving for certified divers, basic courses from discover scuba diving to professional courses like Divemaster and Assistant Instructor and we also offer snorkeling for everyone, around the beautiful ‘Isola Bella Marine Park’ in Taormina. With Sea Spirit Diving Resort you will have an unforgettable experience on one of the most beautiful islands of Europe, Sicily! Imagine being weightless and seeing the most beautiful fishes and other underwater world creatures that this world has to offer. Imagine you could ‘fly’ in mid water. This is really possible! Your dreams of jumping into the water and go diving can become true with Sea Spirit. 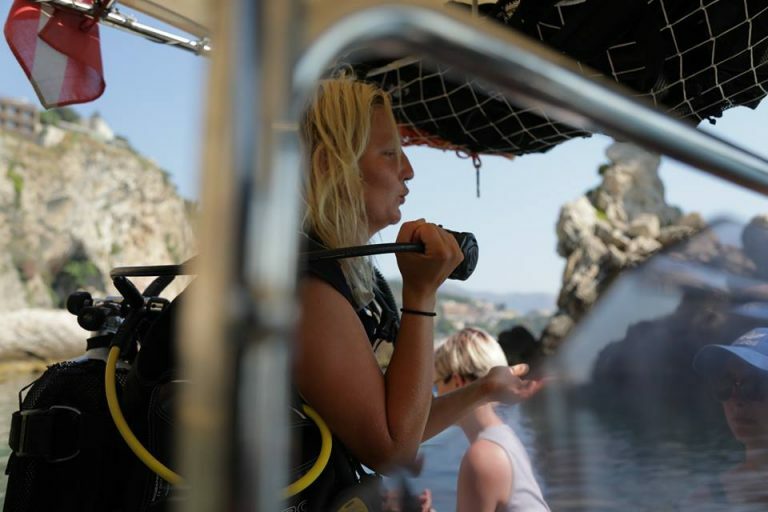 Whether you want to discover the world of diving, become a fully certified diver, improve your dive skills, or want to start a career in diving, Sea Spirit has the possibilities for you! Under the guidance of Carmelo Sgroi, PADI Master Instructor, and Cilla Lentz, PADI IDC Staff Instructor, and our crew, we will give you the best service as possible when it comes to experience, knowledge, equipment and skills. Make your dreams come true, find the courage you never knew you had, do the things you always wanted to.. Join us! The crew of Sea Spirit welcomes you! We work with the largest dive organization in the world, PADI (Professional Association of Diving Instructors). Becoming certified with PADI gives you the opportunity to dive around the world, as PADI has more than forty years of experience, over 136,000 PADI Professionals and more than 6200 dive shops and resorts worldwide. Start your dive career with Sea Spirit Diving Resort! Ever thought about making a career out of diving? Sea Spirit organizes Dive Master Training at our resort in Giardini Naxos (Sicily) and offers Instructor Development Courses in cooperation with Dive-Careers.com in Koh Tao, Thailand. After you finished you dive education, we have several opportunities abroad to start your dive career. With music and stories you will spend unforgettable days with Spirit Sea Diving Resort where both divers and non-divers will have the chance to swim, snorkel and enjoy the excitement of the first dive (baptism of the sea) to approach the world of scuba diving, as also with our courses from open water diver to assistant instructor. The different spots start from the Naxos Calcara , one of the first approaches of the Greek in Sicily, the Roman Columns, then along the marine park of Isola Bella, the beautiful bay of the blue cave to finally arrive to the rock ‘du Zio Innaru’ next to the bay of Taormina Mazzarò.